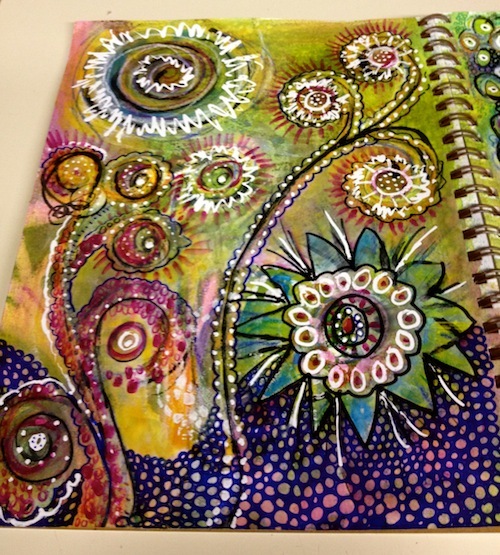 I signed up for the free online journaling workshops offered by Strathmore, and the first one up is Doodling Unleashed taught by Traci Bautista. I completed lesson one and thought I would share the steps I took to create the doodle above. 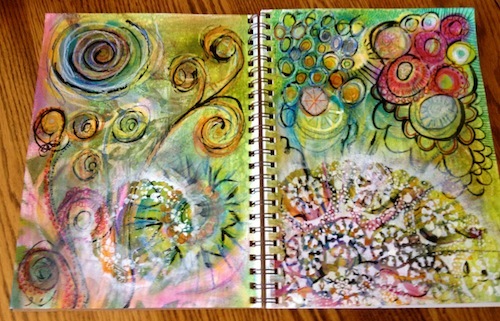 I'm working in a 9 x 12 mixed media visual journal from Strathmore. The first step is to create a background using simple printmaking techniques and whatever objects you have on hand. I used my spray inks with a stencil I cut from a wallpaper sample, a piece of string, and some metal gears. Traci used a large sheet of paper for her demo so she didn't have to work around the binding in the middle. The next step is to paint over some of the prints created with acrylic paints and a light wash of color to tie things together. Next comes doodling with oil pastels. The next step is to use india ink and a liner brush to add details in black. This is where I ran into a little trouble. I had a hard time controlling the brush strokes and the ink didn't adhere very well over the oil pastel. It looked a lot easier when Traci did it on the video! At this point I was pretty unhappy with the results of the ink step and decided that I would most likely rip the pages out of the journal and begin again. I moved on to another project, and was having some fun with a paper stencil and white paint. Since I was planning to start again, I decided to stencil over the parts of the doodle where I was most unhappy with the black ink. The next day I started a new doodle and hated that one even more. (It happens, right?) I went back to the journal and decided to persevere and just finish it off. It is a learning experience after all. The final step was to add more doodling with markers and a white out pen. Traci used copics in her demo, but since I don't have any of those, I used color sharpies instead. I also added a little more color with gouache and a water pen. I like the pages more today than I did yesterday. Sometimes a little distance really helps to improve a journal page. I think I'll quit while I'm ahead. Even though I'm not thrilled with my results from the first lesson, I think it's pretty cool to see the progression from start to finish. Although you can barely see the original stencils and shapes from the first photo, they did lay the groundwork for the finished doodle. There are three more lessons to go in the first workshop, so hopefully I'll get the hang of this looser method of doodling by then. 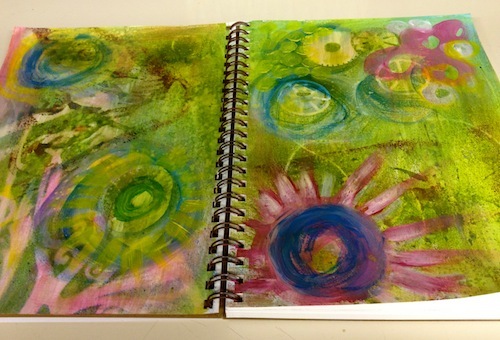 It's not too late to join the fun and learn some new journaling techniques. 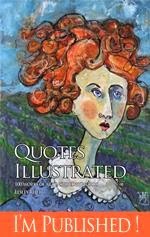 Go herehttp://www.strathmoreartist.com/workshop-reg.html if you want to check it out. Pat, YOU might not love the result but I absolutely adore it! You've inspired me to sign up to the class immediately! I like it--great doodles! I'm taking the workshop, too--like you, I went through a rough patch about halfway through my first piece. I did a second piece today, tho, and like it more. Have fun! Hey, thanks for the link Pat. That looks really exciting! I love what you have done. The black india ink and the white gouache really make your pages ping. I did a workshop with Traci Bautista a few years back when she came out to Australia. She was lots of fun and lots of great ideas. I just love how your show the stages Pat. 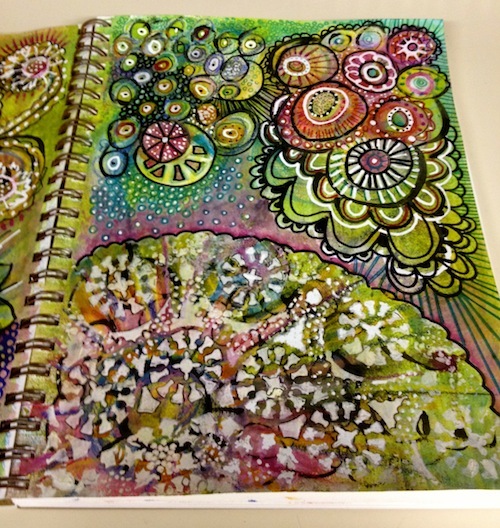 This doodling is not just your typical talking-on-the-phone doodling-its amazing!